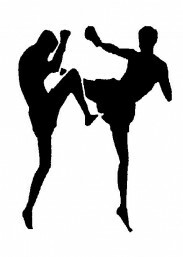 Kickboxing – originated in the 1960’s is a group of martial arts and stand up combat sports based on kicking and punching. This extreme sport can be seen used as self defence, general fitness or as a contact sport. Stressed? Angry? Want to relax? Kickboxing is known for relieving all of these problems as well as helping individuals with their health. Such as Calorie burning, improving cardiovascular fitness and toning, enhancing balance, improving flexibility, coordination and mental health. These are but a few of the health benefits that you can gain from whilst doing Kick boxing exercises and training – bearing in mind that the programmes require individuals to have well functioning muscles and joints to participate. Truly, undergoing Kick boxing training allows you to enjoy a unique program that combines exciting adrenaline rush with a no nonsense workout. ‘PALCIC TAEKWONDO’ is a truly dynamic and forwards thinking martial arts chain of schools. Their aim is to provide students and the general public access to the best and most professional martial arts knowledge and training. Why not book a free trial class with us?